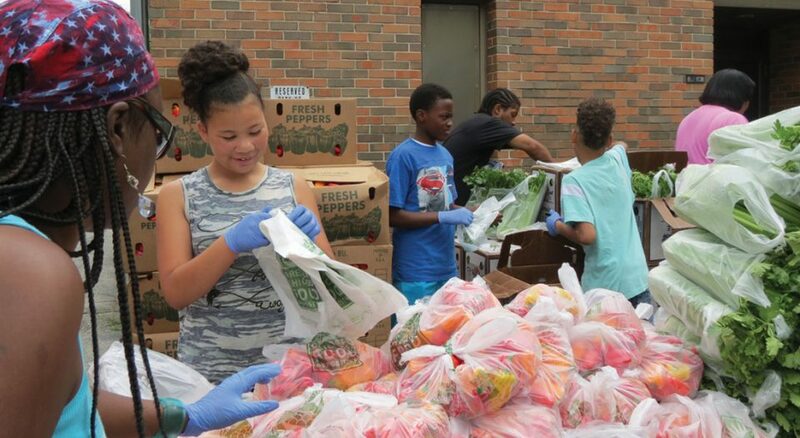 Members of Shekinah Chapel in Riverdale, Ill., partner with the Greater Chicago Food Depository to provide nutritious food to residents through monthly Producemobile visits. Every time it rains in Riverdale, Ill., the basements of homes, churches and schools are filled with sewage, overflowing into the streets and alleys. The sewer systems on the city’s north side, which haven’t been replaced since before the Great Depression, don’t meet the demands of the current population. Shekinah Chapel, an ELCA congregation, helped start a community organization to hold elected officials accountable for the sewers and other quality of life issues in Riverdale. Due to Riverdale Organizing for Change, residents were finally able to say, publicly and collectively, “We deserve better.” Shekinah moved from Chicago’s South Side to Riverdale in 2006. At first the congregation offered a variety of its signature ministries in hopes they would appeal to Riverdale residents: contemporary and hip hop worship, arts programming, food and clothing pantries and youth mentoring. But these generated little interest. Since moving to Riverdale, Shekinah’s worship attendance has increased from the original 35 people to an average of 125. Membership from the immediate neighborhood has grown from 5 to 30 percent. Shekinah leaders credit this growth with a willingness to engage with the neighborhood, taking on issues that matter to residents’ daily lives. Today Shekinah provides residents with access to nutritious food through monthly Producemobile visits in partnership with the Greater Chicago Food Depository. With the help of volunteers, the bus distributes fresh produce to 200 families each month. But this program is just a temporary fix in a neighborhood that lacks access to nutritious food options. Curry dreams that one day residents will open a food cooperative that would give them a sense of ownership and self-determination in a community that is otherwise subject to the whims of outside ownership. Shekinah leaders understand that the ministry they do in Riverdale is right in line with Jesus’ministry. They, like Jesus, put themselves into relationship with their neighbors by listening,naming and taking collective public action on the injustices that diminish their lives. The congregation gathers for worship and organizes, so the abundant life God intends might be realized in their community. Engh, an ELCA pastor, serves as ELCA director for congregation-based community organizing.